What areas mesothreads are for? Most common areas are areas under mouth, cheeks (smiling lines), forehead lines, neck lines, under chin, jaw line. Body areas include décolletage, breast stretch marks, hands, arms, abdomen, elbows and knees. Mono threads are best for skin sagging and fine skin wrinkles, especially at active mimic areas. With age, our skin become less tight, some skin wrinkles, loose areas are formed. 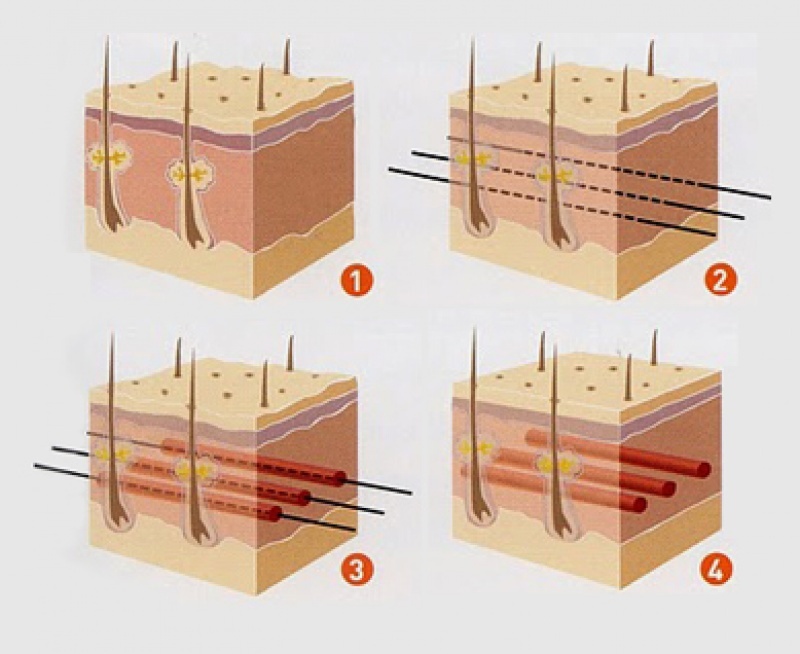 Mesothreads introduce intradermal (inside deep layer of the skin) supporting structure. Most common requests at our Melbourne cosmetic center are to achieve more “natural” lift of the skin with as less “toxins” injections into the face. Melbourne patients are searching for safe and effective cosmetic treatments. Monothreads meet such expectations. It is fully dis-solvable medical grade cosmetic thread and boost collagen production to make your skin firmer. Threads allow smile looks younger with softer wrinkles around mouth. With age, our skin become less tight, some skin wrinkles, loose areas are formed. 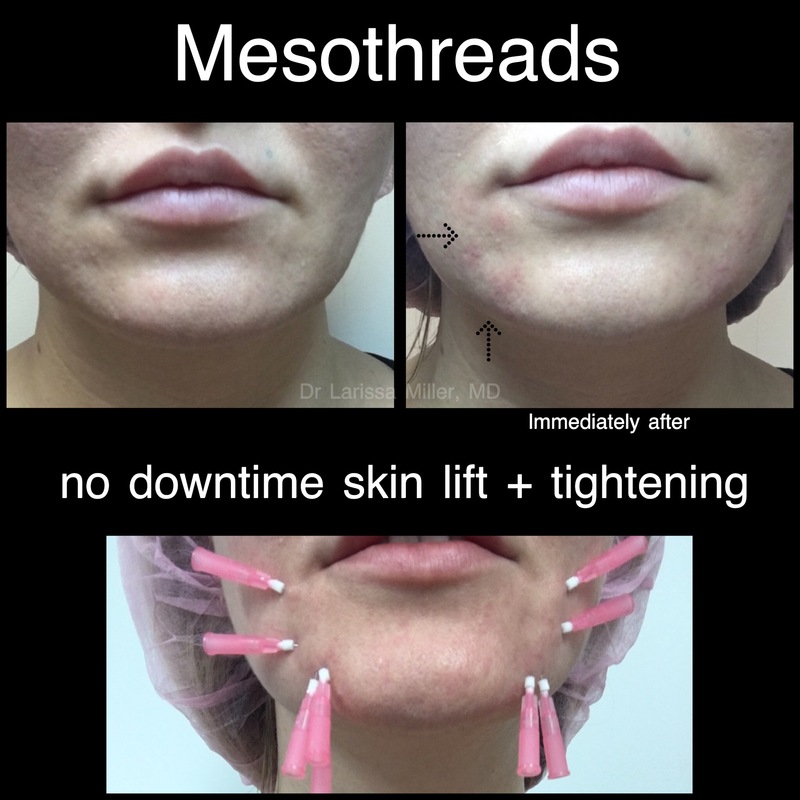 Mesothreads introduce intradermal (inside deep layer of the skin) supporting structure. Eyelid lines improvement (one of most popular for Melbourne cosmetic clinic, but you need to discuss with the expert cosmetic doctor 1st at the free cosmetic consultation – there are contraindications and doctor will offer you alternative eyelid wrinkles treatment ). You can book online here. In summary, mesothreads can be used at any area, where you would like to make skin firmer and prevent loosening and aging. none, it is a lunch time procedure. Our Melbourne cosmtic patients are usually busy and appreciate cosmetic procedures without time off work. Life is too short, no time for sitting at home. Like any other medical cosmetic needle procedure, it is a possibility of bruising and infection, but mesothreads are usually well tolerated. Like one of VISTA Clinic Australia Melbourne lovely clients said “it’s a right swelling in a right places”. Bruising can be masked with concealer. VISTA Clinic Australia Melbourne also can use vascular laser and/or coral peel to speed up recovery from bruising. What to expect with thread treatment? What are options for eyelid wrinkles? Lower eyelids’ skin is thin. Lack of elasticity with age, gravity pulling down and excess skin causes wrinkles under eyes. Muscle relaxants can soften the eye movements, therefore wrinkles will be less deep. Bulges are still not improved with such approach. Peeling and laser can polish the uneven surface of the skin and tighten, but deep wrinkles and bulges are not improving much. Plasma heating action removed an old damaged epidermal skin cells, and heating up lower skin levels, promoting collagen tightening. The problem with plasma in this area that burning can be achieved over the wrinkles, not the whole eyelid. threads provide skin support over the whole surface. Also, preventative for further thinning and gravity prolapse. 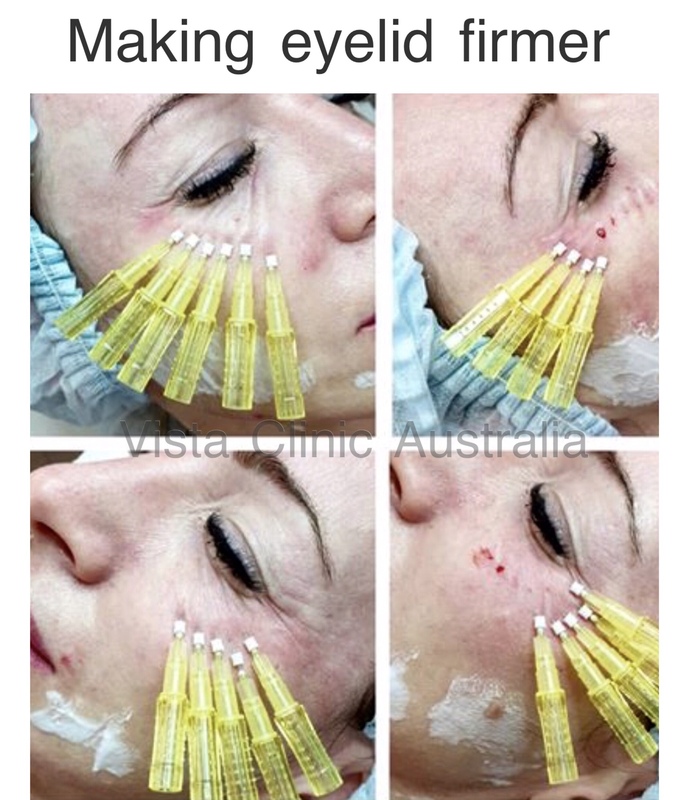 Mesothreads are not always a good option, please, discuss best option for your individual situation with an experienced cosmetic doctor at the VISTA Clinic Australia in Melbourne. Our consultation for cosmetic options is complementary and free of charge. Another popular mesothreads area in our Melbourne cosmetic clinic is eyebrow tightening. As we age, forehead above eyebrows is getting smaller and eyebrows moving down. Threads stimulate collagen production and pulling up effect, lifting eyebrows up. Our skin firmness and tightness are being weakened and lost as we age. Aging skin is thinner and more easily breakable. As we move muscles under skin (smile, kiss, talk, close eyes etc) – our skin is being easily folded into wrinkles, which stays wrinkles when we don’t smile. This is a breakage of the skin architecture from “wear and tear”. 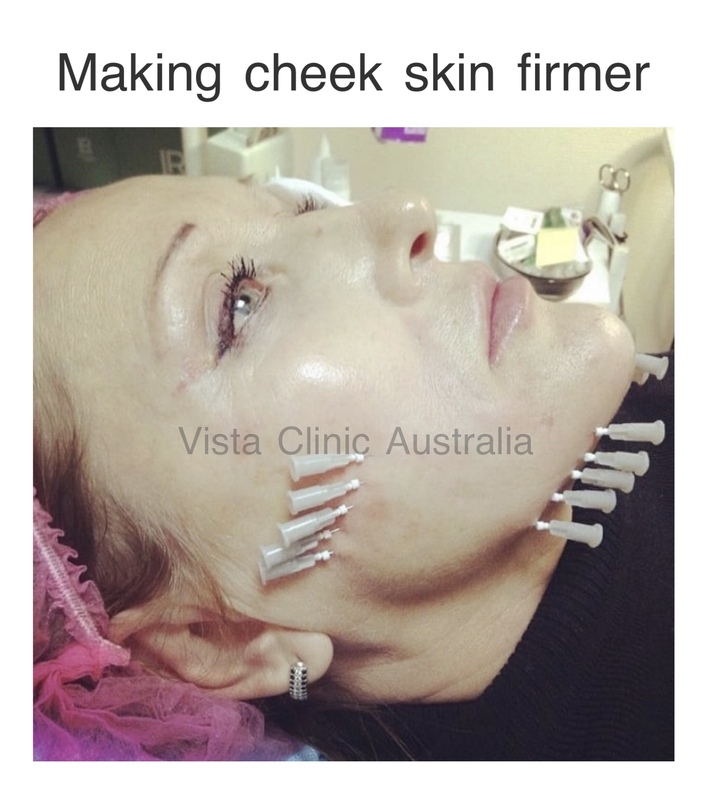 VISTA Clinic Australia Melbourne cosmetic clinic often treat aging skin, including making skin firmer and less breakable. Experienced cosmetic doctor at Melbourne will discuss with you number of options, which best suits your skin and budget (cheaper cosmetic injections is not always better, but definitely you should get best results for budget). Meso PDO threads are absorbable type of medical sutures, which create a mesh inside the skin, restoring skin firmness and even look. Straight threads make your skin straighter. PDO skin threads provide immediate effect. It’s a lunchtime cosmetic procedure, which Melbourne patients appreciate – no downtime is important. One of the best treatments for skin wrinkles and loosen skin, especially in mobile area. Make up look better when skin is firm and even. Mesothreads are also safe – it works on within the skin, making one of the skin layer firmer, more elastic. All important structures like nerves and blood vessels are much deeper. What are advantages of the mesothreads? placed inside the skin to create nice and even karkas and smooth the skin breaks, wrinkles. Considered to be 1 of the best cosmetic medical procedure for skin lifting and tightening. Tiny, almost painless needles introduce absorbable collagen stimulating threads. The effect is immediate, but lift and skin tightening will be better within next 2-4 months. Threads are also used for rejuvenation of the smokers lines ( vertical lines around the lips ), marionette lines under mouth (“sad look” lines ), neck lines. Threads make firmer skin under chin, sagging jaw line improvement, lifting corners of the eyes. And many others. Such “broken” architecture of the skin by mimic is hard to straighten and elastic, karkas building threads are the best option for wrinkles. Mesothreads are usually well tolerated without any pain relief or with topical numbing cream. Thread insertion is similar or less painful than your anti-wrinkle injections. Mono threads needle is tiny, you can barely see it. If patient would like painless cosmetic procedure, anaesthetic is always an option, free of charge. However, numbing injections will cause more chance of bruising and swelling. Topical numbing cream also irritative for skin and associated with swelling. So far no patients in Melbourne cosmetic clinic have requested pain relief for small threads procedure. Strong prescription only numbing cream is also available at our Melbourne cosmetic clinic. What are adverse effects and risk of threads? Mesothreads are safe. Experienced cosmetic doctor inserts threads into the skin, which is way above of potential danger areas of the face. Most common side effect is bruising (approximately one in five patients), redness and swelling in the insertion site. Assymetry is always a risk, but rare (VISTA Clinic Australia Melbourne clinic cosmetic doctors never seen it with mesothreads). 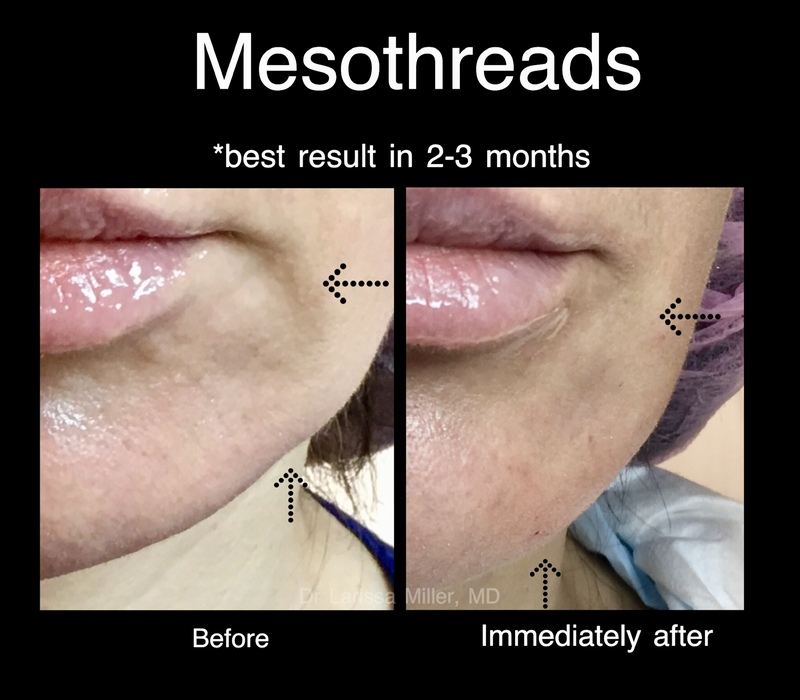 Mesothreads also can last not as long as our cosmetic patients would hope. Skin tightening mesothreads treatment is usually well tolerated. What is postcare advice after thread insertion? 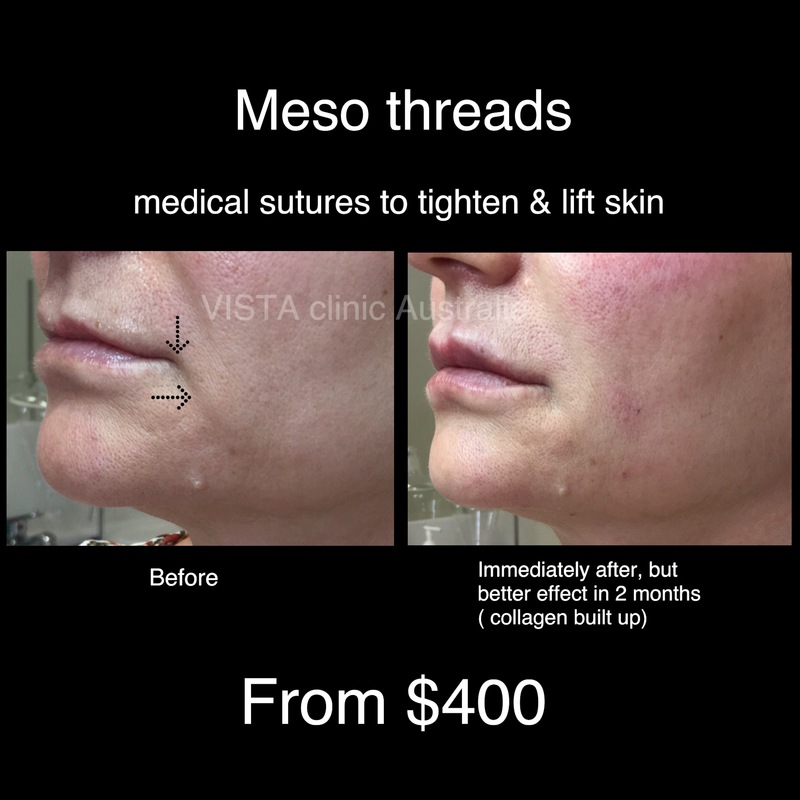 Mesothreads at VISTA Clinic Australia is a safe and well tolerated procedure without downtime. You can return to work straight after mesothreads facelift. Melbourne cosmetic Doctor will give you advice and a small bag with samples, alcohol swabs and instructions. 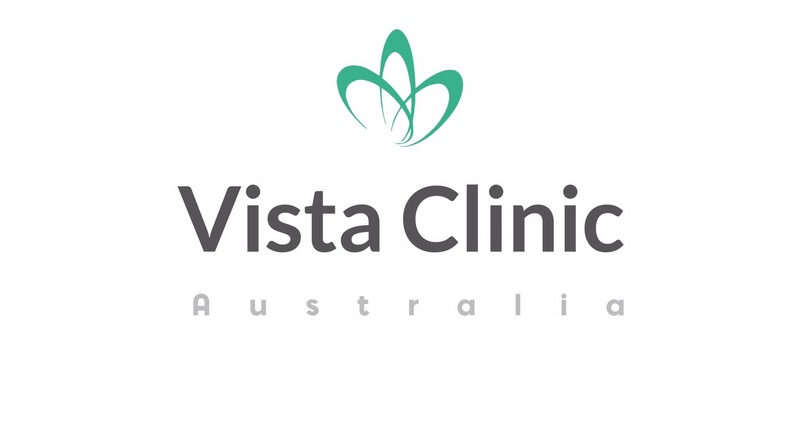 More detailed info you can find at the postcare instructions page of VISTA Clinic Australia here. In case of any concerns or problems, our Melbourne cosmetic doctor will review you for free. Correction of cosmetic procedures done at VISTA Clinic Australia Melbourne are free of charge. You can book appointment online yourself or over the phone with our reception staff. How to get cheek skin tightening? Smile lines on cheeks are tricky to treat because it is a highly mobile area. Face movements pump out and may displace filler from there. Also, with age lower face getting heavier and to add more volume might be not that great idea. Peelings, laser can provide some improvement, but they act on too superficial level. Threads are being used in this area for prevention of aging and improvement of age related changes – lines, irregularities, jaw lines. Small needle creates a linear trauma, stimulating regeneration and leaving a small PDO thread inside, which is stimulating collagen formation via foreign body effect.